Establishing large neighborhoods can get you easy points. However, “investing” into these territories with your buildings early in the game might be a risking deal since others can come in an over bid you. Sometimes, it is better to create small districts that you can dominate completely rather then shoot for large ones. If you create a “4” district, you only need to fill it will two small “1” buildings to get the full points and prevent any one from getting a second place scoring. You can create these easy small districts all in one turn. 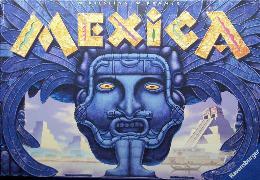 Use water ways (the lake and canals) for fast movement of your Mexica rather then the wasteful 5 MP teleport action. If you need to move a bridge, you should pull a bridge that someone is going to use on their next turn. That is, if there is only one bridge in or out of a district and there is an opponent’s Mexica in the district, pull that bridge. It will cost them another MP to put it back. To counter the above tactic, finish your turn on a bridge. This guarantees your penalty free movement next turn. Watch out for final scoring of unfounded districts. This is the number one rule that new players forget as they focus on building founded districts. This component of scoring can cause great swings in the point standings. Throughout the second half of the Mexica game, keep an eye on where those large tracks of unclaimed land are forming up and be prepared to drop a few large buildings into them during the last few rounds. Return to the starting for an easy 5pt at the end of each round. You don’t always have to use your six movement points. Don’t forget to store a few up during “quite” turns. This will allow you to seize a scoring opportunity.